SAS doctors play a vital role in NHS service delivery, but historically their role and expertise have been under-recognised and under-valued. In recent years an increasing number of doctors have chosen to become SAS doctors rather than enter higher speciality training and this trend is set to continue as the demographic of the medical workforce changes and greater flexibility in working hours is sought. SAS doctors have distinct training and educational needs from those of trainees and consultants. They are a diverse group with individual and often highly specialised skills. We believe it is vital that SAS doctors are better supported and that the SAS role must become a more attractive career option if we do not wish to risk losing highly skilled doctors from hospital medicine. develop and publish the Charter for SAS Doctors to clarify the roles and responsibilities of SAS doctors and their employers, regardless of specialty or affiliation. We believe this should be adopted by NHS employers, Royal Colleges and all involved parties to demonstrate a commitment to professional development. Please visit our events calendar for information on future SAS events. SAS doctors are also encouraged to join the College to benefit from a wide range of professional support. 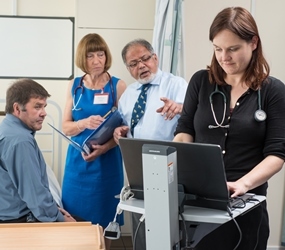 Starting from as little as £5 per month (equivalent), and with membership categories for doctors with and without MRCP(UK), you can access a wide range of online education, the Royal Colleges of Physicians of the UK CPD Diary for Physicians (value £125 per year), support for revalidation, discounted attendance at College events and other membership benefits. We want to represent you and support your needs. Please let us know what the College can do for you. If you are interested in becoming involved on the sub-committee, we would be delighted to hear from you.